Merrily grew up showing Hunters and Equitation in NJ and NY. She graduated with an Equine Science degree from the University of Findley. After college Merrily split her year between Argentina, where she broke and trained warmbloods and learned to play polo, and NY where she ran a Hunter/Jumper program. Moving to Florida, Merrily spent 7 years running a successful H/J program at the Vero Beach Polo Club where students competed at WEF and HITS. She also helped a number of polo players work on their riding skills with “Polo Equitation” lessons. The mix of both disciplines has greatly enhanced her love of teaching. Merrily moved to Houston 4 years ago to start a dedicated H/J program at HPC. Together with instructor Amy Leroy, they teach adults, who just want to get back to their childhood love of horses, and kids who dream of the champion ribbon. Merrily is also the current President of the Greater Houston Hunter Jumper Association, helping to promote the love of competition at exceptionally run Hunter Jumper Shows. As a daughter of two professional polo players, Paige has been riding since she was old enough to walk. 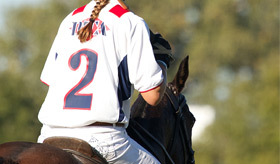 Her love for polo began twelve years ago when she decided to participate in the Houston Polo Club’s polo school. Paige has been teaching beginner riders and players for the last seven years. Her emphases are on balance, safety and fun while meeting one’s personal goals. Paige received her Bachelors of Science in Psychology from Colorado State University and recently completed her Masters in Occupational Therapy from Texas Woman’s University. Breaking down and explaining fundamentals of riding and polo come naturally because of her experience, education and equestrian background. Amy began her riding career in Stavanger, Norway at a small, nationally recognized hunter/jumper facility. There she learned her foundational skills in the Forward Riding System. Amy’s decision to transfer to the United States did not alter her passion. She quickly teamed up with trainer Noelle Lejuez and continued her work with hunters and jumpers. It was then that she had the opportunity to work with and learn from multiple Olympians and other outstanding trainers in order to strengthen her skills. As a student at Texas A&M, Amy worked for multiple polo teams exercising and caring for strings of polo horses. Gaining valuable skills in horsemanship and furthering her desire to continue as an equine professional, she joined up with Merrily Quincoces at the Houston Polo Club upon graduation. Currently, Amy is a member of the USHJA, USEF and GHHJA. She is a board member for the Greater Houston Hunter Jumper Association and a certified trainer with the United States Hunter Jumper Association. She also works alongside Merrily, teaching both children and adults. With 4 years at the club and 18 years of experience with horses, she has established a group of exceptional riders who successfully compete both locally and within the A circuit. She has also regrounded her initial passion of training young horses and is responsible for the educational growth of multiple horses on the property.